How do you design a hypersonic airplane that can travel from Beijing to New York in only two hours at 6600 miles per hour? Dr. Cui Kai and his group from State Key Laboratory of High Temperature Gas Dynamics, Institute of Mechanics, Chinese Academy of Sciences set out to tackle this problem. After three years of innovative research, they presented a body-wing-blending configuration with double flanking air inlets layout to aim at design requirements of high lift-to-drag ratio as well as high volumetric efficiency of next generation hypersonic airplanes. This is a design example of hypersonic airplanes. Moreover, a novel forebody design methodology which by rotating and assembling two waverider-based surfaces is firstly introduced. Their work, entitled "Conceptual design and aerodynamic evaluation of hypersonic airplane with double flanking air inlets", was published in SCIENCE CHINA Technological Sciences 2013（8）issue. Air-breathing hypersonic vehicles has been much concerned by United States and other developed countries since the mid-20th century, and a series of research projects has been proposed since 1980s. The completely integrated design of the airframe and propulsion system is generally adopted for the air-breathing hypersonic vehicles, however, as both the aerodynamic performance for the airframe and the engine intake/exhaust requirements shall be taken into account simultaneously, the design difficulty increased dramatically. 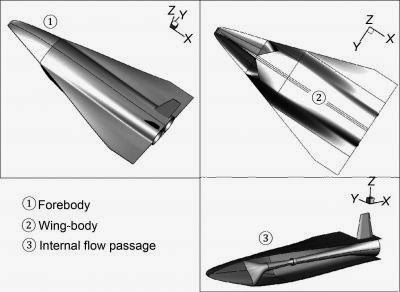 The current aerodynamic design for hypersonic vehicles is mainly for the demonstration vehicles which focused on minimizing resistance and the optimal matching between airframe and engine, and the forebody and engine inlet integrated design is the key issues for the configuration design. The current air-breathing hypersonic vehicles can be mainly divided into two categories according to the different inlet layouts, i.e. with nose inlet and with ventral inlet. The hypersonic vehicle with nose inlet layout, such as the U.S. HyFly hypersonic demonstration vehicle, can efficiently achieve uniformly distributed airflow with high total pressure recovery coefficient for the engine by decreasing the interference of airframe to the maximum extent. The popular internal waverider inlet is also suited to the nose inlet layout. The ventral inlet layout is the most commonly used layout for hypersonic vehicles, the U.S. X-43 and X-51 etc. demonstration hypersonic vehicles are all designed with ventral inlets. It is characterized with engine mounted on the abdomen, and the forebody is designed as a waverider or lifting-body which not only provides high-quality airflow for the engine inlet but also generates great lift force to improve the lift-to-drag ratio and pitching-balance performances of the vehicle. 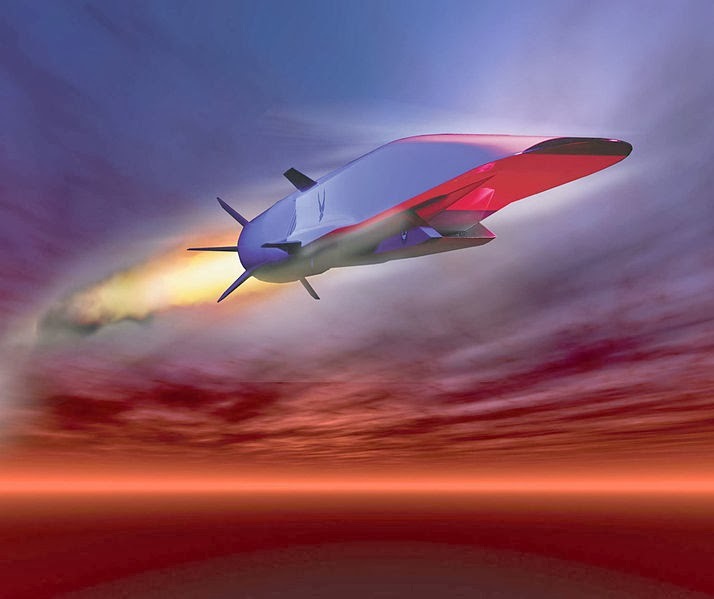 With the progress of scramjet research, various air-breathing hypersonic vehicles are bound to gradually enter the practical stage. As the air-breathing hypersonic vehicle can be considered as a development of modern high-speed airplanes with the extended flight speed and flight altitudes, the researchers deem that the existing design ideas/experience of high speed airplanes should be retained or referred to some typical high speed airplanes. By drawing on the merits of the existing airplane configuration design philosophy, a novel forebody design methodology which by rotating and assembling two waverider-based surfaces is firstly introduced, and a body-wing-blending configuration with double flanking air inlets layout is also presented. On this basis, a conceptual hypersonic airplane powered by double symmetric scramjet is proposed. Since numerical simulation has become a powerful tool of aerodynamic performance analysis, some typical configurations of forebodies and the whole airplanes with different wing leading edges are evaluated by CFD. The results for forebodies analysis show that large air mass flow, high lift-to-drag ratio, and uniformly distributed flowfield at the inlet cross section can be assured simultaneously. The results of the whole airplanes analysis show that high lift-to-drag ratio depends on the shape of the wing leading edge to a large extent. Further work for the design of the engine inlet and the optimization design of wing leading edge will be carried out based on this study. As the forebody with double waverider-based surfaces retains advantages of the waverider, such as high mass flow, high lift-to-drag ratio, etc., the existing ventral inlet design experience can be useful for the inlet design. In addition, the optimization of the wing leading edge shall focus on the cruise flight condition, and the target shall be the reduction of wave drag and efficient capture of the high pressure caused by side compression. This research project was supported by a grant from the National Natural Science Foundation of China. Is Space-Time Smooth Or Grainy? Hacking Earth's Climate: Good Idea Or Bad? Can A Glass Of Wine A Day Keep The Doctor Away?